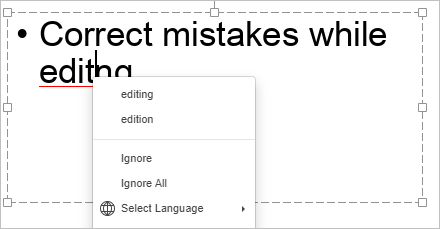 Presentation Editor allows you to check the spelling of your text in a certain language and correct mistakes while editing. First of all, choose a language for your presentation. Click the icon on the right side of the status bar. In the window that appears, select the necessary language and click OK. The selected language will be applied to the whole presentation. To choose a different language for any piece of text within the presentation, select the necessary text passage with the mouse and use the menu at the status bar. open the File tab of the top toolbar, select the Advanced Settings... option, check the Turn on spell checking option box and click the Apply button. Incorrectly spelled words will be underlined by a red line. select a different language for this word. open the File tab of the top toolbar, select the Advanced Settings... option, uncheck the Turn on spell checking option box and click the Apply button.